Many people love light roast coffee because this roast level brings the most origin character of particular coffees. At this level, you can differentiate the origin of coffee by their taste and aroma. Not all coffee is great when light roast, some of them doesn’t taste balance and have some undesirably taste. If you are a light roast drinker, go ahead and read our article below, because we are going to introduce you to two great light roasted coffee, which are Starbucks Blonde Roast Veranda and Willow Blend. Starbucks is the most famous coffee company and coffeehouse chain in the world. The brand is originated in America and was first founded in Seattle, Washington in 1971; by 2017 Starbucks operates in more than 27 thousands location all across the world. In their stores, Starbucks offer their customer a wide range of products while is known to popularize dark-roast coffee. Starbucks serve hot and cold drinks, espresso, cafe latte, etc. Aside from coffee they also offer tea products, such as Teavana, Fresh Juices, and pastries. Starbucks has a wide variety in whole bean and ground coffee category; some of them may only available in some region and the other may available worldwide. They offer their whole and ground coffee based on the roast level including seasonal products. Starbucks has all type of roasts start form dark roast, which is their popular roast since 1971 to light or blonde roast. If you are interested on other Starbucks coffee, you can read our article on Starbucks Veranda Vs Bright Sky here. Starbucks Blonde Roast Veranda is a variant in the blonde or light roast ground coffee by Starbucks. The coffee beans used for this blend comes from Latin-America. The name itself, was inspired by Latin American coffee farmers that is known to watch their coffee trees from their veranda while sipping a nice light roast coffee. Starbucks Blonde Roast Veranda is light bodied; taste mellow and soft with medium acidity. Since it is light roast, it is bound with higher caffeine content and has hints of soft cocoa and lightly toasted nuts. Starbucks Blonde Roast Veranda is available in several convenient formats, such as K-Cup Pods, Verismo Pods, and the VIA Veranda Instant Coffee. Starbucks Willow is another light roast coffee variant of Starbucks, which described as bright, complex and full-flavored with a crisp finish. The coffee beans used to make Willow Blend comes from multi region; Latin America, Africa, and Indonesia. Willow is carefully and gently roasted to create a full flavor that is surprisingly layered. Willow is the perfect combination of juicy lemony notes in African coffee with a crisp finish courtesy of Latin American beans. Starbucks Willow is lighter bodied; high in acidity, just like typical light roast coffee, with bright and clean notes. Willow is only available in whole bean and it is recommended by Starbucks itself to ground the coffee just before brewing to get the perfect brewed coffee. 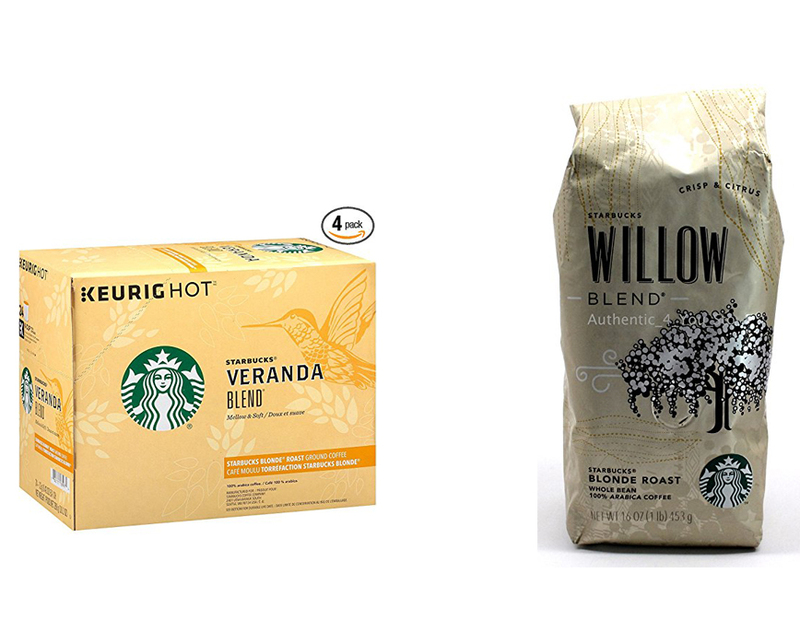 Starbucks Blonde Roast Veranda and Willow coffee are both being part of Starbucks Blonde or light roast coffee category. Both of them are light-bodied and contain higher caffeine. However, caffeine contain is also depend on the type of beans used as ingredients. Even though they are similar, it doesn’t mean they don’t have any difference. For example, Veranda has lower acidity level than Willow. Veranda has mellow and soft taste with hints chocolatey and slightly roasted nuts, while Willow has bright and clean taste with hints of citrus flavor. Veranda only use Latin American beans, while Willow use multi region beans, mostly from Latin America and Africa. When it is time to decide which one is better between both, we will leave it all to your personal taste and preference. For people who prefer less acidity in their coffee, you may want to opt for Veranda and for those who prefer bright, clean and the tanginess of citrus in their coffee may like Willow better.